Airbus and Boeing: Rivals or Partners? Undoubtedly, Airbus and Boeing are considered to be not only the most powerful units in the large jet airliner market but arch rivals, too. Each of their achievements and loses receives extremely precise look and judgment. By this time more than a half year has already passed and the Farnborough Air Show has come to an end. Consequently it means that the interest in the plane makers’ activities and current results is rapidly growing, what issues a reasonable demand for some overviews and makes a question arise: how is it going now? Generally, a key factor which influences all the manufacturers’ business brunches and acts as a deciding feature concluding whether the company tastes success or no is the number of orders and deliveries. According to the data provided by Boeing, by 19 July 2016 it was fortunate to receive 369 orders while Airbus by 30 June 2016 – only 227 ones. However, gross orders rarely remain constant until the delivery time comes. Various factors might serve the reason for changes that take place in the order book. For example, sometimes delays might appear because customers consider cancelling their orders in favour of the new products that come onto the market. Thus, by 19 July Boeing counted 48 changes and by the end of June Airbus faced 44. For example, depending on the numbers it could be concluded that until 30 June 2016 Airbus had greater loses in terms of bookings than Boeing because Boeing remained with 310 net orders while Airbus only with 183. Nevertheless, a half year calculations might be considered slightly different from the June ones. What concerns firmed orders, that month seemed to be more successful for Airbus due to the fact that Boeing lost out to their European rivals on 15 orders. It means that Airbus took 27 bookings and Boeing had only 12. Though, the final yearly results are still unpredictable. Obviously, both jet airliner market giants are deeply interested in attracting as many customers as possible and not losing their potential clients as well. As for Airbus, in June it has expanded its order book for a best-selling A320 Family aircraft with 27 new contracts with the undisclosed clients for the single-aisle jetliners in both the NEO and CEO versions: eleven A320neu, twelve A321ceo aircraft and four A321neo. Comparatively, Boeing has taken six orders. The month’s orders were led by six 767-300s for FedEx and three bookings from Okay Airway Ltd for 737 MAX. No one denies that orders are vitally important for the whole business development; however deliveries are considered to be the major drivers that determine all the income and the total company’s success. According to official data released by aircraft producers, by the end of June Airbus has appeared behind leading Boeing. Boeing delivered 375 products while Airbus managed to provide only 298 planes. 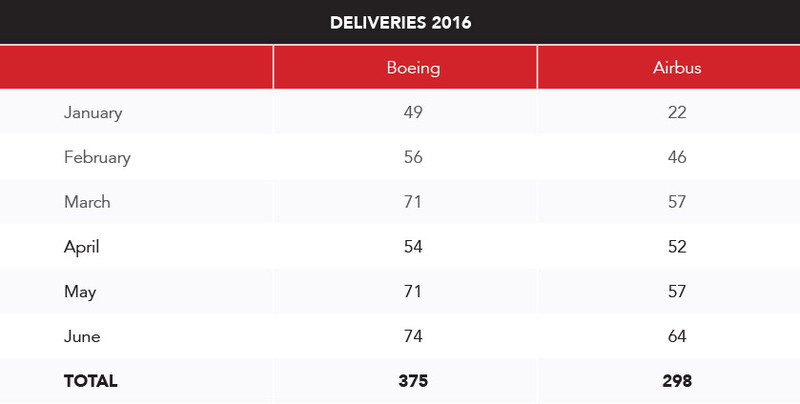 What concerns particularly June, Boeing outweighed Airbus by 10 aircrafts as long as the last one delivered 64 products and Boeing even 74. It is important to mention that out of 64 total deliveries Airbus provided 28 A320coe’s and 23 A321ceo’s. Moreover, in June Airbus delivered aircraft for two new operators: Tibet Airlines and French Blue. Not that long ago the Farnborough International Air Show met the end line. For a number of years this major event carries a significant value for the aerospace and defence industries by providing them with a perfect opportunity to present the aircraft and attract more potential customers. The results of this show definitely influence the ordinary activity of each manufacturer that participate in the show, thus the biggest attention is usually focused on Airbus and Boeing companies again. According to the official statements, Airbus managed to outweigh Boeing with 279 orders and commitments worth USD$35 billion at list prices, compared with 182 Boeing aircraft orders. Although both plane makers stated that they were extremely eager to interest their customers and make their orders match with deliveries, it was noted that this year both companies took lower number of orders than last year in Paris. Thus, last year Airbus had successfully ended with orders and commitments for 421 aircraft worth USD$57 billion while Boeing lagged behind with 331 aircraft worth USD$50.2 billion. Without any future goals there would be no motivation and reason to strive for something. Thus, recently Airbus and Boeing have released their market outlooks with magnificent future plans and forecasts. There is no doubt that announced predictions as well as numbers are very impressive and will be believed to become a reality. Depending on the information provided by Boeing, over the next 20 years there is expected a demand for 39 620 new aircaft valued at USD$5.9 trillion. Comparatively similar forecasts are provided in the Airbus’ Global Forecast. In 20 years time it predicts a demand for at least 33 000 new airplanes worth USD$5.2 trillion. In general, the most intense competition is possible to appear in the one-aisle market because of essential growth rising due to the low-cost carriers and developing markets. Currently the A320 Family and the latest generation A320neo Family are believed to be the one-aisle market leaders. Consequently, Airbus is not willing to lose its dominant position. Nevertheless, Boeing also expresses a strong wish to successfully serve the segment precisely eyed by its rivals. According to Boeing, particularly this sector will need more than 28 000 new aircraft what might lead to more than a 5 percent increase over the last year. 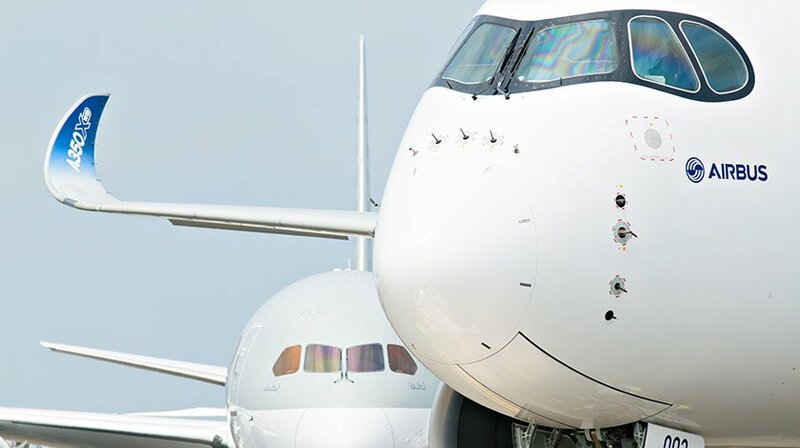 In turn Airbus holds the belief that there would be a demand only for more than 23 000 new planes valued at US$2.4 trillion in a single-aisle market segment. What concerns the widebody market, both companies foresee the growth, too. Boeing forecasts the need for more than 9 000 new planes, including possible wave of replacements in the 2021-2028 time frame. Thus, Airbus releases similar predictions stating that in 20 years time there will appear the need for over 9 500 widebody and freighter aircraft, approximately worth US$2.8 trillion. Finally, plane maker’s predict steadily increasing passenger traffic growth per year over the next two decades. Airbus forecasts 0.3% lower passenger traffic growth than Boeing. According to the last it will grow up to 4.8% when Airbus foresees only 4.5%. However, it is impossible to guess what the future will bring as long as too many factors might have impact on the development of the whole aviation. The only thing that might be surely concluded is that a demand for new pilots and engineers will be obviously very high. On the whole, without any doubts Boeing and Airbus are overall global jet airliner market leaders and it is difficult to highlight which of the manufacturers is on a better track. Both companies attempt to overcome its rivals, thus, the key aim of their activity is not only to acquire as many customers as possible but also deliver all the ordered airplanes without any changes and obstacles. By the end of June Airbus lagged behind Boeing with its orders and deliveries; however, the participation in Farnborough Air Show 2016 allowed to reach some equality as well as balance and begin the competition from the blank page. The bigger efforts the better results!